In rheumatoid arthritis, T cells and B cells participate in the immune responses evolving in the synovial lesions. Interaction between T cells and B cells is probably antigen specific because complex microstructures typical of secondary lymphoid organs are generated. 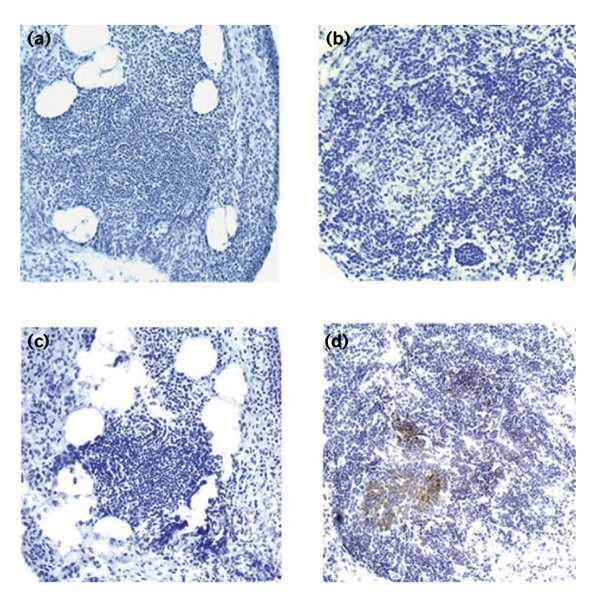 Differences between patients in forming follicles with germinal centers, T-cell–B-cell aggregates without germinal center reactions, or loosely organized T-cell–B-cell infiltrates might reflect the presence of different antigens or a heterogeneity in host response patterns to immune injury. Tertiary lymphoid microstructures in the rheumatoid lesions can enhance the sensitivity of antigen recognition, optimize the collaboration of immunoregulatory and effector cells, and support the interaction between the tissue site and the aberrant immune response. The molecular basis of lymphoid organogenesis studied in gene-targeted mice will provide clues to why the synovium is a preferred site for tertiary lymphoid tissue. B cells have a critical role in lymphoid organogenesis. Their contribution to synovial inflammation extends beyond antibody secretion and includes the activation and regulation of effector T cells. Protective immune responses directed against infections and malignancies are generated in specialized lymphoid organs localized at strategic sites [1,2]. Their main purpose is to optimize immune reactions by bringing together rare antigen-specific T cells and B cells and by providing the infrastructure for the optimal pairing of lymphocytes and accessory cells . The degeneration of such secondary lymphoid organs causes severe immunodeficiency, fortifying the concept that spatial arrangements, in addition to frequencies of immune cells, are critical for immunoresponsiveness. Although lymph nodes, spleen, tonsils, and Peyer's patches are the main sites of host immune reactions, lymphoid microstructures can also emerge, aberrantly creating novel sites for the activation and maturation of T cells and B cells. Aberrant lymphoid organogenesis is generally associated with pathologic immune responses . A prime example is rheumatoid arthritis (RA), in which complex lymphoid microstructures are created in the inflamed synovial membrane [5,6]. Specifically, synovial lesions form highly sophisticated spatial arrangements of T cells and B cells, at times proceeding to the generation of germinal centers (GCs). Extranodal GCs can occur in other autoimmune diseases, but they are encountered infrequently. Tertiary lymphoid organizations have been described in some patients with Sjögren's syndrome and occasionally in the pancreas of mice with type I diabetes mellitus [7,8]. The presence of GCs in the rheumatoid joint emphasizes that these inflammatory lesions are involved in generating strong immune responses [1,9], almost certainly to specific antigens. In addition, it lends support to the critical role of both T cells and B cells in rheumatoid pathogenesis. The impetus for understanding how these extranodal lymphoid organs arise is obvious: they might provide clues to the antigens driving the immune process. New therapeutic targets might be identified when the cellular and non-cellular components of synovial GC reactions have been identified, and fundamental insights into the process of lymphoid neogenesis might be gained. In addition, because only a subset of RA patients is able to generate GCs, a molecular understanding of this pathway might lead to the identification of markers useful in dissecting the heterogeneity of the RA syndromes. Synovial infiltrates in rheumatoid synovitis produce an array of lesions . Regular participants in the tissue infiltrates are T cells, macrophages, and hyperplastic synoviocytes [5,11]. In many, but not all, patients, B cells also accumulate in the synovial membrane. In a series of 173 RA patients, 60% of synovial biopsies were classified as having diffuse infiltrates with T cells and B cells and no distinct topography. In 34% of patients, tissue-invading T cells and B cells were compartmentalized. As in secondary lymphoid organs, B cells cluster in follicle-like structures in a close spatial relationship to CD4+ T cells and CD8+ T cells. The ratio of T cells to B cells accumulating in the follicles is strictly regulated, indicating a well-choreographed chain of events in the formation of this anatomy . Synovial T-cell–B-cell follicles occur in two mutually exclusive and equally frequent forms (Figure 1). The first are T-cell–B-cell aggregates that lack proliferating B cells in the center, are composed mostly of IgD+ B cells, do not have follicular dendritic cell (FDC) networks, and therefore have not generated GC reactions; the second are T-cell–B-cell aggregates that have all the morphologic characteristics of classical GCs, including well-developed FDC networks and Ki-67+ proliferating B-cell blasts that have downregulated IgD. These FDC+ T-cell–B-cell aggregates have all the components for GC reactions, and molecular studies have documented that immunoglobulin gene hypermutations are generated [12,13,14]. In essence, the rheumatoid synovium can serve as a site for aberrant lymphoid organogenesis. However, some observations have identified special features of synovial GCs in comparison with their classical counterparts in secondary lymphoid organs (Table 1). A recent study has used micro-manipulation to isolate CD20+ B cells and tissue-residing plasma cells . B cells were activated, underwent clonal expansion, and shared identical rearrangements. Surprisingly, these rearrangements, supposedly directed at generating high-affinity antibodies against the initiating antigen, were not detected in the plasma cells. It is possible that events in synovial GCs do not totally mimic similar pathways in lymph nodes. The question is also raised as to the origin of synovial plasma cells, which have a critical role in secreting disease-relevant antibodies. Are they simply outliving rapidly cycling CD20+ B cells? Are they recruited to the lesions instead of being generated in situ? What are the mechanisms attracting, retaining, and guiding B cells and plasma cells in the synovial tissue? Another typical feature of synovial GCs is the presence of CD8+ T cells expressing CD40 ligand (CD40L) . CD8 T cells have not yet been implicated in the series of events leading to GC reactions . When synovial tissues with lymphoid follicles were analyzed, frequencies of tissue-residing CD8 T cells were identified as a distinguishing factor. CD8+CD40L+ T cells were absent from tissues with T-cell–B-cell aggregates and no GC formation, but they were enriched in synovial samples with typical GCs. With the use of microscopic imaging, these cells were localized at the outskirts of the T-cell–B-cell clusters. Preliminary functional data from these CD8 T cells are available. They were described as lacking the pore-forming enzyme perforin, a molecular marker associated with cytolytic capability, and instead transcribed high concentrations of interferon-γ (IFN-γ) . Why would CD8 T cells, instead of CD4 T cells, have a role in regulating synovial GCs? One possible interpretation could be that the antigens recognized in these lymphoid microstructures preferentially target CD8 T cells responsive to endogenously processed antigens. The formation of lymphoid microstructures by T cells and B cells in rheumatoid synovitis. T cells and B cells infiltrating the synovial membrane are arranged into highly organized structures. Synovial lymphoid microstructures include two mutually exclusive types of T-cell–B-cell clusters, those lacking GCs (a, c) and follicles with central GCs (b, d). In both microstructures, T cells and B cells are mixed in a well-maintained ratio. Centroblasts and centrocytes in the follicular sample indicate a GC reaction that is missing from the aggregate sample. The stain in (a) and (b) was hematoxylin. CD23-expressing FDC networks were detected by immunoperoxidase technique with 3',3'-diaminobenzidine tetrahydrochloride substrate (c, d). Centers of follicles with GCs were occupied by FDC networks, reminiscent of typical secondary follicles in lymph nodes. No FDCs were identified in T-cell–B-cell aggregates that lacked GCs. It is not known whether synovial T-cell–B-cell aggregates resemble structures represented in secondary lymphoid tissues. 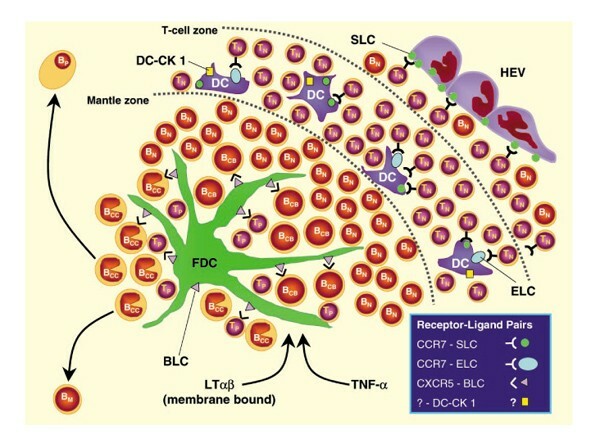 Schematic model of specialized cell populations and chemokines instrumental in the formation of GCs in secondary and tertiary lymphoid tissues. BCB, centroblastic B cell; BCC, centroclastic B cell; BM, memory B cell; BP, plasma B cell; DC, dendritic cell; HEV, high endothelial venule; TN, naïve T cell; TP, primed T cell. The complexity of the topographic arrangement and function of GCs is the result of an orchestrated effort by lymphocytes, non-lymphoid stromal cells, cytokines, chemokines, and growth factors controlling the traffic of leukocytes into compartments of lymphoid organs [16,17], optimizing contact to antigens and providing the infrastructure for optimal cooperation to yield effective immune responses (Figure 2). GCs are critical for the affinity maturation of antibodies and the generation of B-cell memory. As they progress through the GC, B cells selectively mutate their immunoglobulin genes and are selected on antigen presented on FDCs, ultimately resulting in the production of high-affinity neutralizing antibodies specific for viral antigens and bacterial exotoxins. By receiving appropriate signals from T cells participating in the GC reaction, mutated B cells expressing high-affinity antibodies differentiate to become antibody-forming plasma cells or memory B cells; B cells with low affinity are eliminated. GCs also have a role in removing B cells that form self-reactive antibody by forcing them to undergo apoptosis. In general, GCs cannot be formed unless supported by antigen-specific CD4 T cells. Although a recent report indicates that under unusual circumstances, high-affinity B cells can be induced to generate GCs in response to (4-hydroxy-3-nitrophenyl)acetyl Ficoll in the absence of T cells. GCs formed without T-cell help were possible only when B-cell receptors were extensively crosslinked and when high frequencies of antigen-specific B cells were available . These GCs also had a short lifespan and aborted conspicuously at the time when B cells are normally selected by antigen-reactive T cells. Two receptor-ligand pairs are crucial in mediating the T-cell–B-cell contact that is essential for successful GC reactions. GC T cells and B cells communicate through the interaction of CD28 and CD80/CD86 and through the crosslinking of CD40 on the surface of B cells by CD40L expressed on activated T cells [19,20,21,22]. Significant progress in understanding the events leading to the recruitment, retention, compartmentalization, activation, and recirculation of lymphocytes in and out of secondary lymphoid tissues has been made in recent years. Mice with spontaneous abnormalities in lymphoid organogenesis or with targeted homologous deletions of specific mediators have been instrumental in developing a model of how immune cells are brought together in defined spaces to generate immune responses. After being released from primary lymphoid organs, such as bone marrow or the thymus, lymphocytes migrate into lymph nodes by crossing the endothelium in a multistep process. Supported by selectins, lymphocytes start to roll on the endothelial layer and then adhere firmly via integrins . It is currently believed that the mass transit of resting lymphocytes across specialized high endothelial venules is facilitated by the expression of secondary lymphoid tissue chemokine (SLC) on the endothelial cells [24,25,26]. Mice homozygous for a spontaneous mutation plt (paucity of lymph node T cells) lack SLC expression and have defective trafficking of T cells into lymph nodes [27,28,29]. In addition, T cells lacking the SLC receptor, C-C chemokine receptor-7 (CCR7), are markedly impaired in their ability to enter lymph nodes and Peyer's patches . B-cell trafficking in plt mice and in CCR7-deficient mice is affected much less, which is compatible with a dichotomy in regulating T-cell and B-cell migration. Once lymphocytes have accessed lymphoid tissues, they effectively search out certain subcompartments; B cells accumulate in B-cell follicles and T cells home to areas rich in T cells. This process is at least partly under the control of chemokines. The current model is that the movement of T cells is guided by two ligands that both bind to CCR7: SLC and Epstein-Barr virus-induced molecule 1 ligand chemokine (ELC) [29,31,32,33,34]. These ligands can probably be produced by dendritic cells, macrophages, and other non-hematopoietic cells residing in the T-cell zones [35,36,37]. Mice with the plt mutation, which have a defect in expressing SLC and ELC, have impairment not only in T-cell entry into lymph nodes but also in organizing T cells in the T-cell areas. In addition, trafficking of T cells through secondary lymphoid tissues is severely disturbed in CCR7-deficient mice . Two molecular pathways have been implicated in regulating SLC and ELC production: signaling by lymphotoxin-αβ (LTαβ) seems to be necessary for the induction of SLC and ELC [1,38,39], and mice deficient in Re1 B, a member of the nuclear transcription factor NF-κB family, have an impairment in secreting SLC . T-cell–B-cell follicles would not be preferred sites of immune recognition unless chances for antigen encounter were markedly enhanced . This is achieved by transporting antigen by specialized cells to the T-cell and B-cell zones of secondary lymphoid organs. Dendritic cells (DCs) are positioned in peripheral tissue; there they capture antigen, transform into activated DCs, become migratory, access lymphatic vessels, and travel to the draining lymph nodes, where they migrate deep into the T-cell areas [42,43]. Recruitment of DCs to the lymph nodes, and the concomitant ferrying of antigens to sites of critical mass, involves the upregulation of CCR7, rendering these specialized cells responsive to SLC and ELC [44,45,46]. It is now believed that SLC and ELC facilitate the entry of DCs into lymphatics and their trafficking to the T-cell zones . DCs in T-cell zones are highly effective antigen-presenting cells (APCs), permitting the priming of naïve T cells. Interestingly, such DCs have been identified as the cellular source of ELC and also of the chemoattractant dendritic cell-derived C-C chemokine-1 (DC-CK 1), raising the possibility that they attract naïve T cells to enhance the opportunity for APC-T cell interaction [47,48]. Once T cells have been primed, they become responsive to other chemokines, guiding their movements in the search for their B-cell partners . B cells that have bound sufficient antigen are redirected from the migration route of naïve B cells and move to the boundary of the B-cell and T-cell zones . A critical role in the compartmental homing of B cells has been assigned to the ligand binding C-X-C chemokine receptor-5 (CXCR5). CXCR5-deficient B cells lack the ability to migrate to splenic follicles, and targeted disruption of CXCR5 prevents the development of B-cell follicles in the spleen [51,52]. The ligand for this receptor has been named B-lymphocyte chemoattractant (BLC). This CXC chemokine is probably constitutively expressed by stromal cells in the center of follicles, presumably by FDCs . Thus, B-cell recruitment seems to be controlled by follicular structures. This model does not provide an explanation for the initial establishment of follicles unless the assumption is made that FDCs are present before B cells are recruited. If that were so, follicle formation would ultimately depend on whether FDCs can be developed or selectively attracted to tissue sites. Some experimental evidence suggests that antigen-specific T cells, when activated by DCs, upregulate the expression of CXCR5, rendering them responsive to BLC . T cells can then selectively migrate towards the BLC-producing FDCs, meet B cells specific for the same antigen, and support the generation of a GC. This model would re-emphasize the critical position of FDCs in the choreography of lymphoid organogenesis . The development and the function of FDCs has been linked with the presence of the cytokines LTαβ and tumour necrosis factor-α (TNF-α) [55,56,57]. One of the activities mediated by these cytokines seems to be the induction of BLC. Given the critical participation of BLC-producing FDCs, LTαβ and TNF-α could also be instrumental in regulating aberrant lymphoid neogenesis. Synovial membrane is ordinarily not a site for lymphoid structures to emerge. In many RA patients, inflammation can persist for years and infiltrating lymphocytes do not acquire defined topographical arrangements. The subset of RA patients with classical GC reactions usually generate numerous follicles, possess this pattern of inflammation in essentially all affected joints, and maintain it over time without switching to other microstructures. Most patients with follicular synovitis form rheumatoid nodules outside the joint. These structures closely resemble granulomatous reactions but, remarkably, in the synovial membrane, follicular arrangements are not mixed with granulomas . It has been proposed that priming of the tissue site has to be achieved during a window of embryonic development to permit the subsequent appearance of primary follicles . The mechanisms of priming are not understood, but it is difficult to envisage that such a priming event would condition the synovium in some patients while sparing others. Nurse-like cells that are able to activate B cells and provide survival signals have been described in rheumatoid synovitis, but it is currently unclear whether their presence correlates with extranodal GCs . Patterns of cytokine production in the synovial microenvironment are clearly distinct in patients with diffuse, follicular, or granulomatous synovitis . Tissue levels of TNF-α, interleukin (IL)-1β, and IFN-γ are low in samples with diffuse synovitis. Follicular synovitis is characterized by an increased transcription of IFN-γ and is typically associated with high concentrations of IL-10. Formation of granulomas is correlated with the production of the highest tissue concentrations of IFN-γ and IFN-γ transcripts and, interestingly, lacks the production of IL-10 in situ. Synovial IL-4 mRNA was found in some patients, indicating that patterns similar to those for both T helper 1 (TH1) and T helper 2 (TH2) cells might be present in rheumatoid synovitis . T cells with the TH1 and TH2 phenotypes have been described to express distinct profiles of chemokine receptors [60,61,62]. Given the central role of chemokines in the establishment of lymphoid microstructures, it needs to be examined whether the differences in the inflammatory cytokines are a reflection of the selective recruitment of distinct populations of T cells into the synovial membrane. Another possibility is that chemokine receptor expression on activated T cells is influenced by the site of initial priming. Support for this model has come from the observation that CCR4+ T cells accumulate preferentially at sites of cutaneous inflammation but avoid the intestinal tract . Finally, it could be proposed that the site of priming and also the nature of the antigen have a direct impact on modulating the chemokine receptor patterning of T cells, thus dictating their trafficking to and retention in inflammatory lesions. Little is known about the molecular components of the synovial microenvironment that determine lymphoid neo-organogenesis. Cell migration in tissue sites is ultimately regulated by chemokine gradients that are established by local deposits but also by the binding of these chemokines, highly basic proteins, to sulfated matrix components and proteoglycans. The final decision about the specific arrangement of lymphocytes in the inflamed synovial membrane might also depend on the composition of extracellular matrix proteins and their distribution in the soft tissue layer. An important aspect of T-cell–B-cell physiology in rheumatoid synovitis is related to the precise function that these immune cells have in the disease process. The focus of GCs in generating high-affinity antibodies suggests that the major function of synovial B cells is the secretion of immunoglobulins, probably including rheumatoid factor [64,65]. Recent data suggest that B cells might contribute to disease mechanisms through pathways not directly dependent on the release of disease-relevant antibodies. In murine models of autoimmune disease, including MRL/lpr mice and non-obese diabetic mice, B cells have been found to be instrumental in the disease process [66,67]. The accumulation of activated T cells, of both the CD4+and the CD8+ subsets, in MRL/lpr mice is highly B-cell dependent [68,69]. The underlying mechanism does not involve antibody-mediated activation because mIgM.MRL/lpr mice, which have B cells but are deficient in serum Ig, continue to generate manifestations of lupus . B cells in the rheumatoid synovium seem to have similar functions. Depletion of B cells from a rheumatoid synovium–severe combined immunodeficiency (SCID) mouse chimera not only destroyed the lymphoid follicles but also abrogated IFN-γ production by T cells and IL-1/TNF-α production. In these experiments, rheumatoid synovium was grafted into SCID mice, the animals were treated with anti-CD20 monoclonal antibody (Rituxan), and transcription of cytokines in situ was quantified from the retrieved grafts . It is possible that B cells could facilitate T-cell activation and inflammatory tissue damage by secreting cytokines and chemokines. A more likely model is that B cells function as critical APCs, taking up antigens through their immunoglobulin receptor and presenting it to CD4 T cells [71,72]. Antigens driving rheumatoid synovitis might be particularly susceptible to capture by B cells in the synovial membrane, favoring B cells as APCs for recruited T cells. The implications of such a mechanism are obvious because the immune response could be disrupted by eliminating B cells from the inflammatory lesions. We thank James W Fulbright for contributions to the preparation of the graphics and manuscript. This work was supported by grants from the NIH (AR41974, AR42527, and AI44142) and the Mayo Foundation.